A full-color, printed follow-along workbook to Kaplan's MCAT Biochemistry Audio Review, including all the figures and images referenced in the audio, and structured space for note-taking. 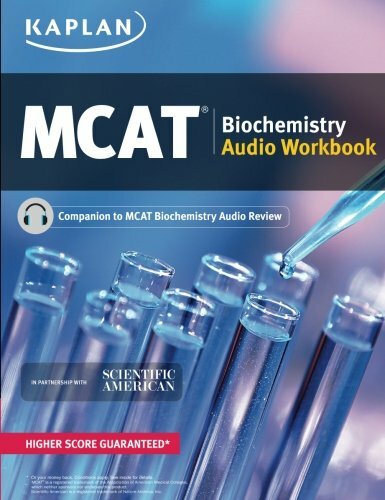 Students who have used Kaplan's MCAT Biochemistry Audio Review say they learned best when listening to the audio with the companion book so they could easily follow along, look at the figures being discussed, and take notes. Specially designed as the perfect companion to the audio course, Kaplan's MCAT Biochemistry Audio Workbook includes complex, colorful figures that add a visual component to the audio conversations. It has also been carefully designed and structured with space for any notes you might take while listening, so that by the time you finish listening to all 12 chapters of audio, this book will be a great source of review to revisit again and again before you take your MCAT. If you have any questions about this product by Kaplan Publishing, contact us by completing and submitting the form below. If you are looking for a specif part number, please include it with your message.